Fluffy, long-grain organic brown basmati rice. It’s unprocessed, so the nutritious bran layer is kept intact. A nutty-tasting, aromatic side for sopping up the juices of a curry or stew. Good with a splash of soy sauce eaten alongside chicken or fish, or for stuffing dolmades and cabbage rolls. Throw into soups or salads to add backbone to your meal. 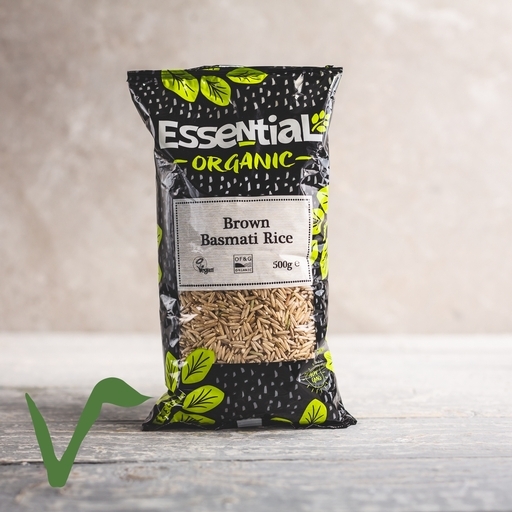 Brown basmati rice has a higher oil content than white rice, so it won’t last nearly as long. Store it somewhere cool and dark and it’ll keep well for 6 months. Or, if there’s space for it in your fridge or freezer it’ll be happy there for up to a year. Store cooked rice in the fridge and eat within 48 hours. Prepared in a kitchen where gluten are also handled.